I create original landscape paintings with oil paint. I use a somewhat limited palette, so I put to work a warm and a cool version of the three primary colors, white and a mix of Ultramarine and Burnt Sienna (to create a black). I paint on both canvas and hardboard, each brings a unique "action" to the paint movement. 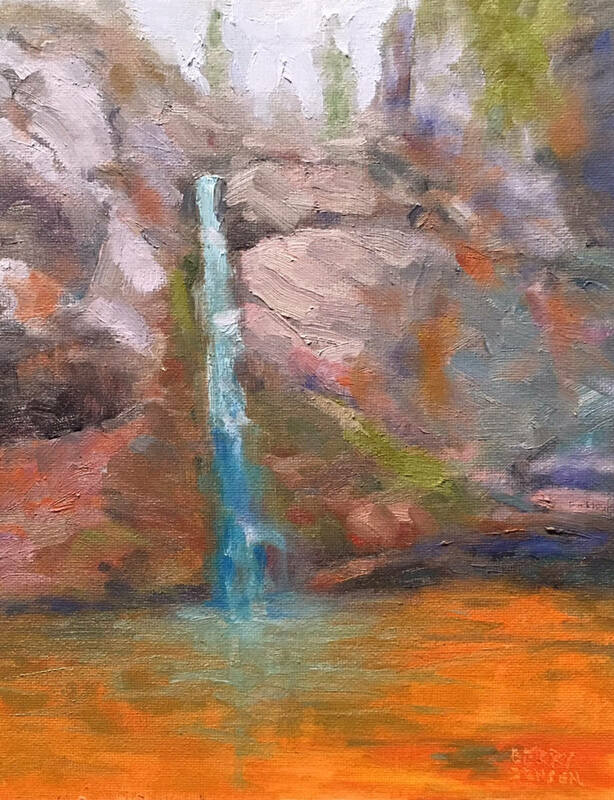 Pthalo Blue, Cadmium Orange and Lemon Yellow are some of the colors I use to help me create the bright, saturated color that I like to share. I never want my painting to be a literal depiction of a scene. I want there to be some room in my image for the viewer to interject their own imagination into the moment. The images that I seem drawn to are in Colorado and Utah. So, most of my paintings are of scenes in this beautiful western landscape. What I try to create is a colorful, expressive, pretty picture. I have a deep desire to share the moments that are so astounding to me and transport every single person to that moment and the joy that I feel. 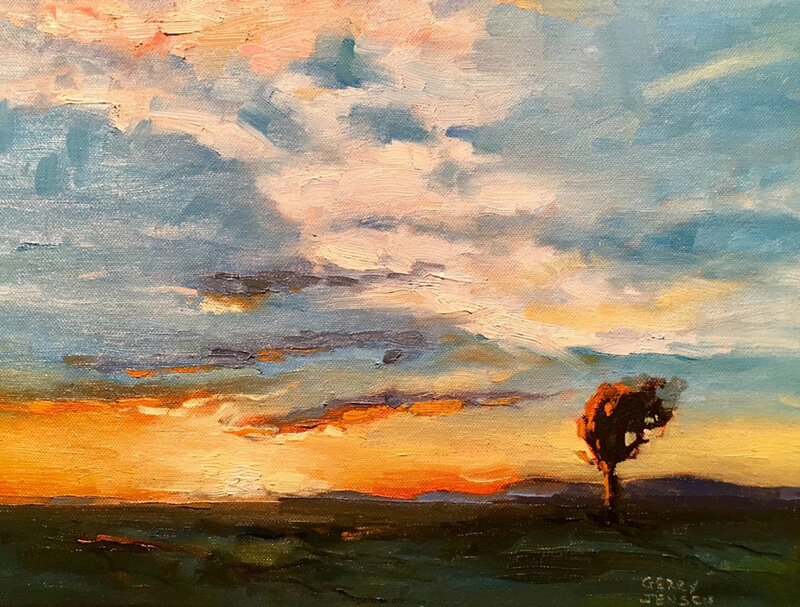 Grand Junction artist Gerry Jensen creates oil paintings that convey the range of beautiful scenes he encounters in western Colorado and Utah. 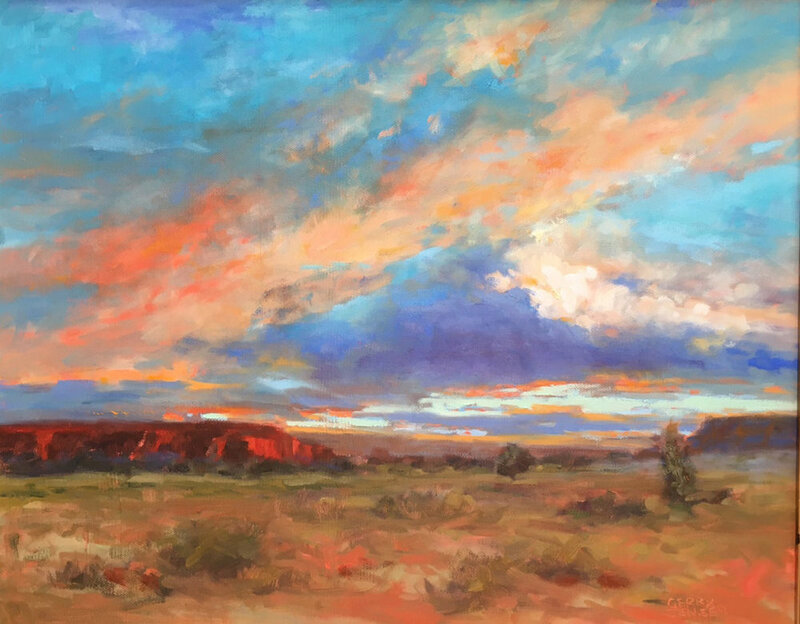 "I see such inspiring splashes of color and light in our western landscapes, my goal is to use my medium to share that sense of awe with my audience." Mostly self taught with a few pivotal workshops, Gerry has over the past 20 years, spent hundreds of hours studying the importance of lights, darks, shapes, and compositions. All with a goal of sharing what he sees and feels with the viewer. "I feel as though the best way to realize my vision of what I want my paintings to say is to paint and paint and be sensitive to all of the subtlety that is before me - then simplify." Long time residents of Western Colorado, Gerry and his wife, Lyla, spend many mornings and afternoons seeking those special moments when light, shadow, and atmosphere come together. " We will never get to them all, but we try." To finish his paintings on a loving note, Lyla creates up-cycled frames for each one.